Bring a large saucepan of salted water to the boil over a high heat. Slice the pork fillet into 2 cm slices and season with salt and pepper. Heat butter in a frying pan over a medium heat and pan fry pork fillet for 1 minute on each side. Keep warm. Cook pasta as per pack instructions in the boiling salted water. Whisk the olive oil, lemon juice and zest, parsley, capers and dill together in a large bowl. Drain pasta and toss through the pesto. 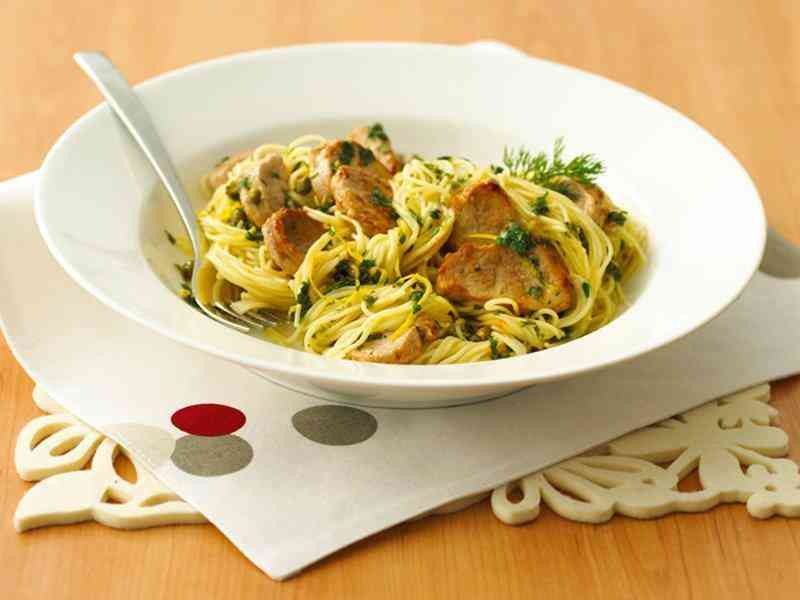 Serve hot in individual pasta bowls and arrange pork fillet over the pasta. Serve garnish with a wedge lemon and freshly ground black pepper. This pasta is also delicious served with a dollop of cream fraiche.